Over the past few years there has been a lot of misinformation swirling in conservative circles about, of all things, light bulbs. Some of the more radical voices on the right have spread a rumor that incandescent light bulbs have been banned, that we are all must switch to squiggly, mercury-laced compact fluorescent bulbs, and that consumer choice has fallen victim to an oppressive socialist agenda. With all of those wild and scary accusations, what is a conservative homeowner to do? First, don’t believe everything you hear. Second, rely on the experts here at Conservatives for Responsible Stewardship (CRS) to light your way. Just as the common-sense energy efficiency standards put in place by the Reagan Administration resulted in a better quality and variety of refrigerators, efficiency standards for lighting has resulted in a lighting revolution. Consumers have never had so many lighting choices. However, more choices can often cause confusion—especially when a bunch of ill-informed folks with big microphones want to gin up controversy. Here is all you need to know about lighting. Too often we hear people incorrectly use “watts” to convey the brightness of a bulb. “Watts” only refers to the amount of electricity used. “Lumen” is the measure of brightness. Generally speaking, an old 100-watt incandescent bulb will produce between 1,200 and 1,600 lumens. 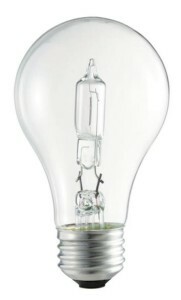 A similar 75-watt bulb will produce between 900 and 1,100 lumens, and a 60-watt version will produce between 700 and 800 lumens. What everyone should want—from both a financial and conservation perspective—is to get the most lumens for the least amount of watts. You want the most value for your money. The old incandescent bulbs rate poorly in this regard, producing only about 14 lumens per watt. Fluorescent fixtures typically give you about 60 lumens per watt, and LED (Light-Emitting Diode) technology can theoretically generate over 200 lumens per watt (but various factors, such as color temperature and bulb design, can reduce that quite a bit). So, the next time you hear someone use “watts” when describing light output, politely explain to them what they want is actually lumens. More wattage just means a thinner wallet in the long run. The incandescent light bulb that has been in common use for the past 100 years is not actually the same as the one Thomas Edison created. His bulb used a carbon filament. It was a Croatian inventor, Franjo Hanaman, who actually invented the tungsten filament-based incandescent bulb that we are all familiar with. Despite the wacky rumors you may hear on talk radio, incandescent bulbs have NOT been banned; they have been improved to last longer and be more efficient. What most people don’t know is that 90 percent of the energy used to power the original incandescent bulbs is wasted producing heat, not light. For 40 years, light bulb manufacturers have known how to make a more efficient incandescent bulb, but there was no financially compelling reason to do so. That changed when widespread concern about energy waste caused states to start passing their own efficiency standards for light bulbs. The manufacturers sought a uniform national standard and offered to produce the more efficient version to get it. That resulted in a 2007 law that set new efficiency and quality standards for certain types of lighting. The manufacturers now have to produce incandescent bulbs that produce the same amount of light, but use 28 percent less electricity. The only difference between the new incandescent bulbs and old ones is that the tungsten filament in the new bulbs is contained in a capsule filled with argon gas to produce more light while reducing waste heat. 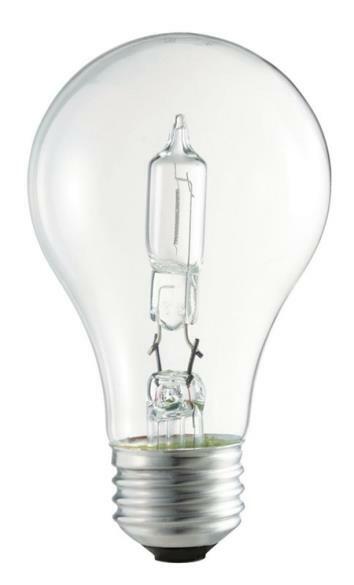 In January of 2012, the old type 100-watt incandescent bulb was replaced with the improved type. No squiggly tubes, no weird color hues, no dim start-up, no dimming problems, no mercury, same amount and quality of light, but using just 72 watts of electricity instead of 100. By emitting less waste heat, the new bulbs also result in less work for your air conditioner during the summer. 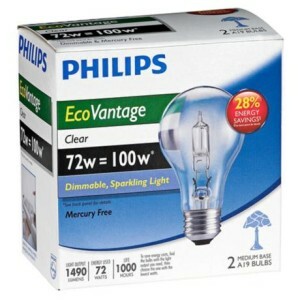 Above is a clear version of the Phillips 72 watt EcoVantage™ incandescent bulb and the box indicating that it replaces a the old type 100 watt bulb. It also comes in soft white and costs about $1.50. Philips (EcoVantage), GE (Energy Efficient Soft White), Sylvania, and Westinghouse all make the more efficient incandescent bulbs and they have been on store shelves since 2011. They cost a bit more ($1.50) than the old incandescent bulbs (75 cents), but they are more reliable and save you $2.80 cents in electricity cost over the life of the bulb. Halogen-based incandescent bulbs are also an option that produces the same light with a 30 percent energy savings and a longer bulb life. It is also worth noting that the new incandescent bulbs are made either entirely or in part in the United States. Any of the old style incandescent bulbs that sneak into the market will most likely be made in China, India, or Mexico. Such bulbs might be cheap to buy, but their poor quality and inefficiency will cost you more in the long run and purchasing them will undermine American jobs. Fluorescent lighting technology, which has been around in various forms since the late 1800s, generates light by sending an electrical discharge through mercury vapor to excite the gas and create light. Fluorescent lighting comes in two common forms, the long tubes most common in commercial buildings and the compact fluorescent (CFL) bulbs that screw into a lamp fixture. The advantages of using fluorescent light bulbs are significant. 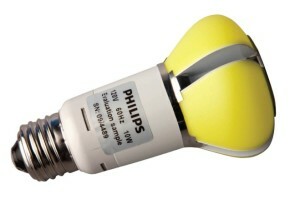 They use up to 75 percent less electricity than incandescent bulbs, last up to 10 times longer, are reasonably priced, provide a quick return on investment, and the bulbs now come in a range of light temperatures (yellow tones are considered “warmer” and blue tones are considered “cooler”) that will work for most any application. Still, even though fluorescent technology has improved over the years, there are limitations in the quality of light it produces and the performance of the bulbs. Most CFL bulbs do not reach full brightness immediately when turned on, many are not dimmable, and some people find the quality of fluorescent light unappealing. In deciding if fluorescent lighting is for you, one thing that should NOT be a big concern is the trace amounts of mercury in them. While it is true that a CFL bulb has an average of 4 milligrams of mercury, that is a hundred times less mercury than is found in a single dental filling or old-style household thermometer. Fluorescent lighting will always have a solid niche in the market-place, but the use of CFL bulbs in household table lamps and residential recessed lighting will most likely diminish significantly over the next five years as the price of LED bulbs, which use even less energy, continue to come down. Not long ago, home lighting choices for consumers were limited to either energy wasting incandescent bulbs that produce great light and function well, or fluorescent bulbs that save energy but have some drawbacks in certain applications. LED technology changed that. It is now possible to have the lighting quality of an incandescent bulb while using less energy than a fluorescent bulb. LED bulbs use light-emitting diodes as the source of light. LED products now on the market produce between 65 and 100 lumens per watt of energy used—although in the lab, LEDs have produced an efficiency of over 200 lumens per watt. The other big advantage of LED bulbs is their long life expectancy, which is typically between 25,000 and 30,000 hours of use (but can go as high a 100,000 hours). At that rate, you might want to include them in your will. By comparison, the old-style incandescent bulbs usually burn out before even 1,000 hours of use. The main barrier to widespread use of LED bulbs in homes has been their relatively high price tag. In 2011, an LED bulb generating the light equivalent to a 60-watt old-style incandescent cost $34. This year, the same bulb costs around $12 and is expected to drop to less than $10 within a few years—as production becomes more automated. Even at current prices, LED bulbs are a smart investment. The upfront cost is more, but due to the dramatic energy savings, the total cost of buying and using an LED bulb is much less than buying and using an old-style incandescent bulb. Operating a lamp using 60-watt incandescent bulbs for 10 years will cost you $219. Operating the same lamp using a 9-watt LED bulb that produces the same amount of light (remember, it’s lumens you want, not watts) will cost you around $47. That is a savings of $172 without any compromise in lighting quality. Multiply that by the total number of bulbs in your house and you can get some idea of the savings potential. 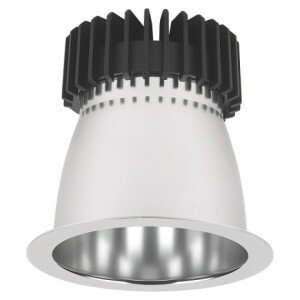 In addition to general purpose screw-base bulbs, LED technology is being utilized in recessed lighting, spot lights, under-cabinet lighting, landscape lighting and outdoor floodlights. In recessed applications, consumers can choose to retrofit existing housings with an LED bulb, or buy recessed housings that contain an integrated LED light engine. Desired Lumen Output – Always make sure that you choose the proper brightness. If you are replacing a 75-watt incandescent, for example, you need an LED with a light output of between 900 and 1,100 lumens. Desired Color Temperature – LEDs come in a variety of color temperatures. A color temperature of 2700 kelvin (K) is the soft white color produced by a typical incandescent bulb. Other choices can range from a slightly brighter 3000 K, to a more bluish 6000 K.
Dimmer Compatibility – Since LED bulbs use electronic components, called drivers, to convert the line-voltage power to a low voltage DC current, to dim properly they need dimmers that are compatible with their driver. Compatible dimmers are often listed by the manufacturer on a dimmer compatibility sheet. Dimmer manufacturers also provide information on dimmer compatibility. Lutron, for example, has an “LED Product Selection Tool” on its website and makes a line of dimmers specifically designed for dimming LED and other low-voltage lighting technologies. According to Lutron, every dimmer automatically saves 4-9% in electricity—even at the highest lighting levels—over a standard on-off switch. And when users choose to dim their lights, the electricity savings will correlate with the level of dimming. For example a bulb dimmed 20 percent is using 20 percent less electricity. Dimming also extends the life of a bulb, regardless of bulb technology. Companies that make high-quality LED bulbs and light engines include: Cooper/Halo, Cree, Juno Lighting Group, Lithonia, Lutron IVALO, MaxiLume, Philips, and Philips Lightolier. General Electric and OSRAM/Sylvania also make LED bulbs, but their websites make it cumbersome to find information about these bulbs. There are some other lighting technologies that are worth considering, particularly for certain applications. High-pressure sodium light bulbs can be a good, energy efficient option for outdoor area lighting. The light produced is very soft, yellow-orange tone. Another technology that is worth mentioning is Electron Stimulated Luminescence™ (ESL) technology. It is similar to fluorescent technology but the company that patented it, VU1, claims that it produces a better quality of light and is mercury free. 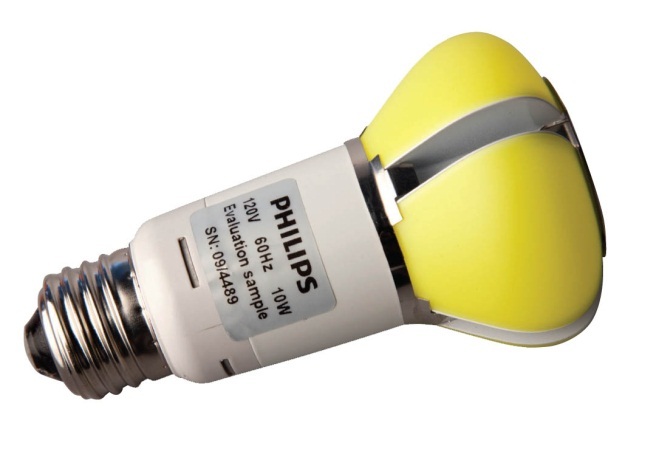 VU1 started manufacturing these bulbs in 2007, yet their market availability seems extremely limited. It’s too soon to tell whether this technology will be viable, but we’ll keep tabs on it. Other conservative icons from Edmund Burke and T.S. Elliot to Theodore Roosevelt and Barry Goldwater have emphasized the inherent connection between conservatism and an ethic of conservation. Some who profess to be conservative today have deviated widely from this conservative ethic and ridicule conservation in peddling their “live for today” ideology. Talk show host Rush Limbaugh is a good example. On his show, he gleefully boasts about how much energy he wastes, pointing out that he never turns of lights and that he air conditions his garage. Regardless of whether he actually is as wasteful and irresponsible as he claims, or was indulging in provocative hyperbole, the remarks were intended to disparage even personal efforts to conserve energy and reduce pollution. Since when did wastefulness and gluttony become conservative traits? Conservation is conservative, not wastefulness. Conservatism requires us to be responsible and prudent today in order to ensure that future generations have adequate resources and enjoy the same quality of life that we do. Energy conservation is also fiscally responsible. Whether it is a car that goes farther on a gallon of gas, or a lightbulb that delivers the same amount of light with less energy, there is no better way to safeguard your budget from the impact of higher energy costs. The conservative choice in lighting is simple. It is the most efficient light you can find to serve your needs. This is the first of a series of “Conservative Guide” articles from CRS to help conservatives practice common-sense conservation and responsible stewardship in their daily lives.